Apple CEO Tim Cook has remained tight lipped about the so-called "Apple Car," but today he dropped a hint about the much-rumored electric vehicle at the company's annual shareholders meeting in Cupertino (via Business Insider). Do you remember when you were a kid, and Christmas Eve it was so exciting, you weren't sure what was going to be downstairs? Well, it's going to be Christmas Eve for a while. 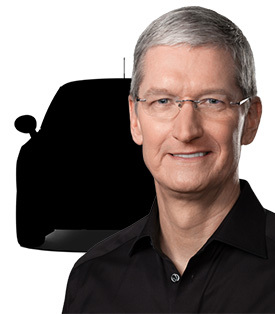 Cook's comment suggests that, if such a project exists, the purported "Apple Car" will not be publicly revealed for quite some time -- in line with reports claiming Apple is currently targeting a 2019 or 2020 production date. Apple has recruited hundreds of engineers from Tesla, Ford, GM, Samsung, A123 Systems, Nvidia, and elsewhere, likely to work on the purported car project, which has allegedly been called "Project Titan" internally. Tesla CEO Elon Musk recently said it is an "open secret" that Apple is developing an electric car, based on its number of recent automotive-related hirings. Other evidence that points towards Apple's interest in the automotive industry includes its discussions with a secure Bay Area testing facility for connected and autonomous vehicles and its meeting with the California DMV to review self-driving vehicle regulations in 2015. More recently, Sunnyvale residents have reported hearing loud "motor"-sounding noises at night on a campus where Apple leases at least one building. Yeah, I’m probably not going to do that. The great thing about being here is we’re curious people. We explore technologies, and we explore products. And we’re always thinking about ways that Apple can make great products that people love, that help them in some way. And we don’t go into very many categories, as you know. We edit very much. We talk about a lot of things and do fewer. We debate many things and do a lot fewer. Apple's internal "Project Titan" team has reportedly faced some obstacles over the past month. In January, supposed "Apple Car" project lead Steve Zadesky informed colleagues that he would be leaving the company for personal reasons. Then, just a few days later, it was reported the "Apple Car" team is on a hiring freeze as Apple executives are unhappy with the progress being made on the development of the vehicle. Other news out of Apple's shareholders meeting today includes the company's commitment to customer privacy and raising its dividends annually. Cook also hinted that now is a "great opportunity" for Apple to acquire smaller technology companies. He said Apple has made 19 acquisitions in the past 15 months.